Sheldon seems to be a very happy pug and wanting to live the good life now. He is receiving vet care and as soon as he is in foster care we should receive an update! 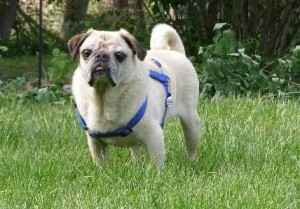 Foster home update: Meet Sheldon, quite possibly the sweetest, handsomest and best-mannered pug you ever will meet. You would never believe that he is: A) 8 years old, since he hasn’t a hint of gray and is incredibly healthy; or B) a puppy mill pug, since he is housebroken, sweet-tempered and gentle. He loves other dogs, cats and, of course, people. He hasn’t been around children much, but he probably would be great with a family. Nothing ruffles his temper. He is a little timid around men at first greeting, but he has bonded big time with his foster dad and follows him from room to room, gazing at him adoringly. He seems to be afraid of steps, or maybe he just isn’t used to them. He will go down the stairs but not up, so if you want him to sleep with you, you’ll have to carry him upstairs! He is a champion cuddler, but will sleep just as happily curled up on his doggie bed. Happily ever after story: We re-named Sheldon (which we thought was super cute) to something that has more personal meaning to us: “Zeke.” He didn’t really respond to “Sheldon” and has learned his new name really quickly! :) Zeke has adjusted very well to his new forever home and was immediately accepted by the human and furry family alike…our cats love him! :) “Mia,” our tuxedo cat, loves to try licking Zeke- we are not for sure if she is trying to groom him or just show him that she loves him! Shortly after adopting Zeke, we noticed that his back legs were pretty stiff. Troy, my husband and also a veterinarian, sadly discovered that Zeke has hip displaysia, a congential arthritic condition. Although we were initially very sad at the diagnosis, we soon reconciled our emotions, identifying (and accepting) that God placed Zeke in our home for a reason; afterall, he will be in great care since his daddy is a doctor! :) We feel fulfilled with Zeke in our lives and thank the PPN tremendously for providing the forum/outlet for us to find such a special life friend.